Happy new year, everyone! We are doing well. 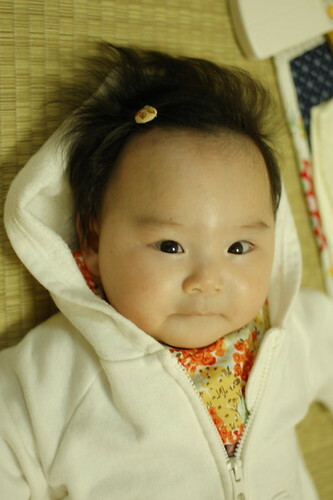 But at Miyu's first Christmas, we all three caught a cold and she had to go to the doctor. And we couldn't do anything but stayed on the bed. Instead of it, we went to some new places during my husband's New year holidays. She liked the acqualium the best. Every day we learn something new from her. Whenever I cannot see my husband well, Miyu reminds me that. Whenever I get too busy, Miyu and my hubabnd make me laugh. 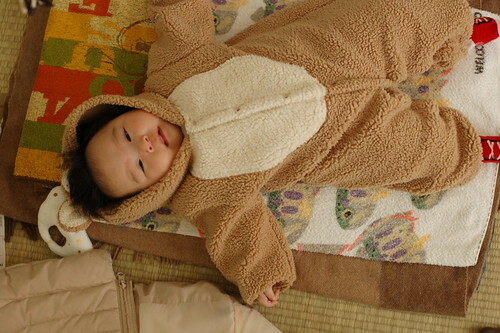 We're growing up with Miyu. Two weeks later we'll visit both of our parents. Both live very far from us so they are looking forward the days. For me it's the chance to take a few days rest (* v *). Now my husband is making dinner for me. I'm taking a rest with Miyu sleeping in my arm.